Do you have shoulder pain with the following activities? Pain when reaching out or raising your arm? Pain when putting on a jacket? Pain when tucking in your shirt or doing up your bra? Pain at night – especially when lying on the shoulder? Pain when pushing something heavy or weight-bearing through the arm? Pain with sporting activities – especially swimming, throwing sports, weight-training? Shoulder pain can be very debilitating and can significantly disrupt normal everyday activities. Lead physiotherapist and shoulder specialist – Eoin Ó Conaire teaches his Shoulder Masterclass to physiotherapists nationally and internationally. 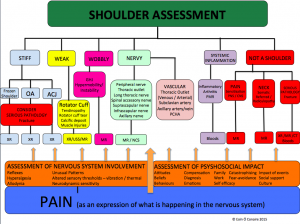 For teaching purposes he has created the model below to break down the different causes of shoulder pain. The majority of people with shoulder pain have pain and weakness related to the rotator cuff. In fact, about 50% of shoulder patients have rotator cuff related shoulder pain. The vast majority of these respond very well to specific rehabilitation exercises. A very small proportion need to have more invasive treatment like corticosteroid injections or surgery. It is very important that you try physiotherapy exercises before considering surgery. The research in this area is very clear. Since 2005, five high quality research trials have shown that exercise is as effective as surgery for rotator cuff related shoulder pain. Furthermore, two excellent trials have shown that physiotherapy exercise reduces the need for surgery by up to 80%. You can read more about rotator cuff problems here. The next most common source of shoulder pain is related to the stiff and painful shoulder. Most of these patients have Frozen Shoulder. 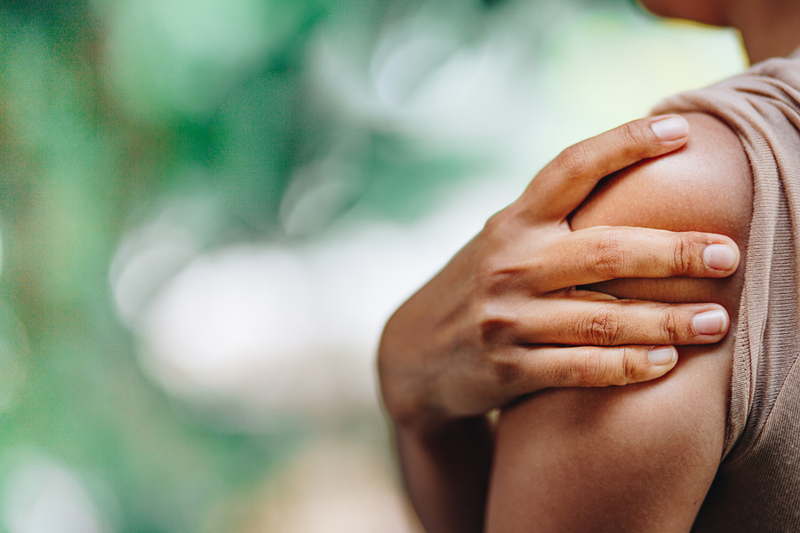 In fact, approximately 20% of the patients that Eoin sees in clinic have this painful condition which causes loss of range of motion in the shoulder and often waking in the night with pain. There are a number of different treatment approaches that can be helpful for this condition. You can read more about Frozen Shoulder here. The third most common category of shoulder pain and problems (representing about 10%) relates to shoulder instability or hypermobility. Whilst rotator cuff problems are most common after the age of 40 and Frozen Shoulder after the age of 50, shoulder instability tends to affect a younger population – from teenagers up to the age of 40. In almost all cases, physiotherapy exercises to improve strength and control in the shoulder are helpful. However, there are times when an operation is required to stabilise the joint. Eoin is very experienced at carrying out a detailed assessment to pick out those patients who require surgical intervention or those who will benefit from physiotherapy. You can read about shoulder instability and hypermobility in more depth here. The other causes of shoulder pain – pain referred from the neck, inflammatory conditions, serious pathology or nerve or vascular problems are much less common and in total make up the remaining 20% of shoulder patients that Eoin sees at Evidence-Based Therapy Centre. He is always mindful that about 1-2% of people who complain of shoulder pain will do so because of a medical condition rather than problems with the muscles, joints or nerves. 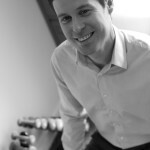 From many years working in orthopaedic triage and assessment in the NHS, Eoin is skilled at identifying these patients and those that require onward referral or further investigation. On the first appointment, Eoin will spend about an hour with you – taking a history, asking lots of questions about how the problem is affecting you and then carrying out a thorough physical assessment. He will then discuss and explain the examination findings, set out the treatment options and agree a treatment plan. Eoin will always tailor the exercises specifically to your needs – to help you achieve your goals. Sometimes further investigations like X-Rays, MRI or ultrasound scans will be required – Eoin will weigh up the pros and cons of these and discuss this with you. If you would like to book an appointment with Chartered Physiotherapist – Eoin Ó Conaire, you can call the clinic on 091 727777 or get in touch via the contact page.